We loved watching Moira and VOCO, her talented partners, pull off their surprising win at the 2007 Harmony Sweeps Finals in San Rafael, CA, especially their introduction of "body percussion to augment their sweet a cappella harmonies. 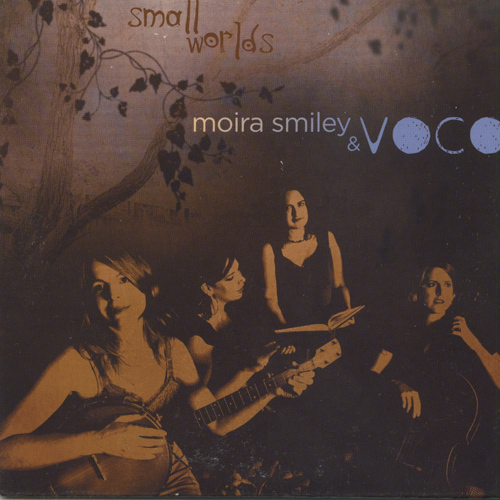 "Small Worlds" is a "physical theater" of four voices, cello, violin, accordion, banjo and body percussion on 10 "post-folk" songs, guided by Bela Bartok. Some of our favorites are: "Izgrejala," "Makedonska," "Silverlake," "Summer Has Come," "Russia" (Siberia's Snows), "Out of a Child" and "The Hat-Matchmaking Song." Haunting, beautiful, powerful and mysterious songs from Moira, Jessica B., Jessica C. and Christine!